Since his first solo exhibition in 1968 Peter Kennard has consistently held a mirror up to the contemporary world with the aim of enacting social and political change. On the 40th anniversary of his first show, Gimpel Fils is pleased to present a retrospective exhibition of paintings made in the wake of the turbulent student uprisings of May 1968. Kennards Stop paintings mark the beginning of what has become a remarkable artistic career. The visual imagery found in these paintings, from the outstretched hand to the silhouetted paratrooper, was to reoccur in Kennards photomontage work throughout the 1970s and 1980s losing none of their visceral power. Kennards radical political stance to the war in Vietnam and the Soviet military clampdown in Czechoslovakia finds visual form in these paintings. As a member of a growing disaffected youth culture Kennards work voiced the concerns of a generation. Having grown up during the height of the Cold War this generation saw the increased global military activity of the 1960s as a return to an old world order. To mark this exhibition Gimpel Fils will be holding a panel discussion, Art and Culture since May 68, exploring the legacies of the student uprisings in Britain. Speakers, including Tariq Ali, Esther Leslie and Hilary Wainwright, will address such issues as whether the visual arts have the potential to instigate political change; has art reflected the realities of political change since 1968 and does political art have a role to play in todays social climate. 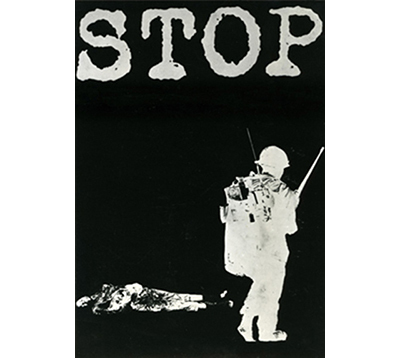 Peter Kennard was born in 1949 and studied at the Byam Shaw School of Art, The Slade and The Royal College of Art. He has been a Senior Lecturer in Photography at the Royal College of Art since 1994. His first solo exhibition was held at St Catherines College, Oxford in 1968. Since then he has exhibited regularly, with work included in major exhibitions such as Art into Society, at the Whitechapel Art Gallery, London, 1978; Through the Looking Glass, Photographic Art in Britain 1945-89, at the Barbican Centre, London, 1989; Media Burn at Tate Modern, London, 2006-7; and Forms of Resistance at Van Abbemuseum, Eindhoven, 2007-8. Kennards work is represented in various public collections including the Arts Council Collection; the Victoria and Albert Museum; the Imperial War Museum; and the Tate. Hailed one of the worlds greatest mediums, Eileen Garrett (1893-1970) founded The Parapsychology Foundation in 1951. Eileen features projected images of the Parapsychology Foundation Library in New York, a strobing edit of archival footage of Garrett and a synchronised 3 screen video work featuring academics and family members talking about Garrett. The charismatic and multi-facetted Garrett is conjured through image and anecdote, and video vignettes recall the dead ducks, the horse riding incident and The Ash Manor Case. In particular, Garrett is brought to life through the descriptions and gestures of her daughter, Eileen Coly. Although ostensibly about Garrett, Eileen can be understood as being as much about her daughter, now in her 90s. MacWilliam first worked with The Parapsychology Foundation and the family of Eileen Garrett in 2006. Last year she was artist in residence at The Parapsychology Foundation during which time she lived with Eileen Coly. A number of curious coincidences occurred during MacWilliams research, including the discovery that in September 1934 some of her own cousins sailed from Southampton to New York on the SS Majestic on the same voyage as Eileen Garrett and her then 18 year old daughter. Garretts daughter Eileen and her daughter Lisette, will travel from New York for the opening of this exhibition. Gimpel Fils is pleased to present Susan MacWilliams first solo show in London. MacWilliams practice involves the investigation of particular individual case histories and myths, particularly those relating to the paranormal, the supernatural and to perceptual phenomena. She incorporates the fields of psychical research, psychology, physiology, into her artistic practice. Using video, photography and installation, her works explore ideas about the presentation and credibility of an image and question vision and perception, reality and illusion. MacWilliam has made work about materialisation mediums, table tilters, optograms, trance, dermo optical perception and x-ray vision. She produces unique works of art that provide a visual entry point into the history of parapsychology.